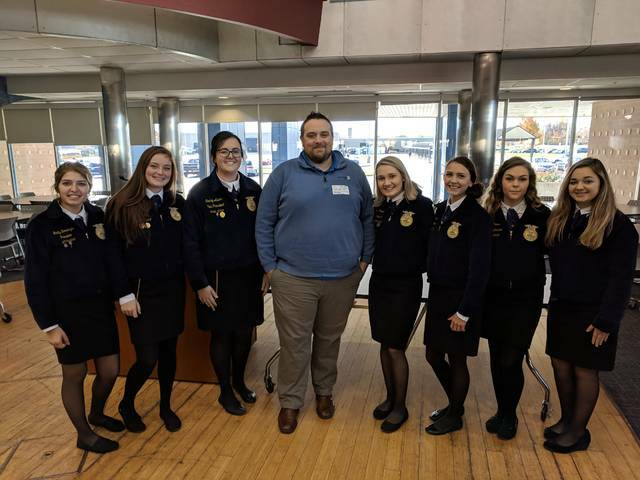 MVCTC FFA officers along with Ronald McDonald House Charities of Dayton Representative, Will Crabtree shared with the FFA Chapter information on the upcoming 38th Annual FFA Charity Auction. Pictured left to right: Trinity Konwiczka (Mississinawa Valley), Lexi Stiner (National Trail), Carley Asher (Preble Shawnee), Will Crabtree (Ronald McDonald House Charities of Dayton), Anna Grant (Valley View), Alexia Hess (Arcanum), Kasey Lawson (Wayne), and Myckala Geisler (Miamisburg). ENGLEWOOD — The Miami Valley Career Technology Center FFA Chapter would like to announce the 38th Annual Ronald McDonald HouseCharity Auction scheduled for Dec. 7, 11:30 a.m. until 2:30 p.m. in the Agriculture and Livestock Production Lab at MVCTC. The MVCTC FFA Chapter is honored to support the mission and efforts of the RMHC Dayton. The MVCTC Charity Auction Campaign is in need of donations that we will auction off on December 7, 2018. Items that are accepted for donations include clothing, toys, tools, hats, craft items, and much more. Every dollar that is raised at the auction goes directly to the RMHC Dayton to benefit the families that are using the services that RMHC Dayton provides free of charge. The MVCTC FFA Goal for the 2018 Auction is to raise $9,00 for the house. To attend the auction on Dec. 7, students, teachers, adults and alumni need to purchase a button for admittance. Buttons are on sale at the door for $1. MVCTC students must have permission from an instructor and must be supervised while at the auction. https://www.registerherald.com/wp-content/uploads/sites/41/2018/11/web1_Auction-Rep-1-.jpgMVCTC FFA officers along with Ronald McDonald House Charities of Dayton Representative, Will Crabtree shared with the FFA Chapter information on the upcoming 38th Annual FFA Charity Auction. Pictured left to right: Trinity Konwiczka (Mississinawa Valley), Lexi Stiner (National Trail), Carley Asher (Preble Shawnee), Will Crabtree (Ronald McDonald House Charities of Dayton), Anna Grant (Valley View), Alexia Hess (Arcanum), Kasey Lawson (Wayne), and Myckala Geisler (Miamisburg).